(CNN) -- Wayne Rooney is set to return to the fray for Manchester United's Premier League trip to West Ham on Sunday after a missing five games with a hamstring injury. Shortly after scoring the winner against Wigan on January 24 Rooeny limped off through injury. Manager Alex Ferguson said on Friday that he will be used as a substitute but is making his star striker available for England's prestige friendly against Spain in Seville next Wednesday. Ferguson said he would talk to England coach Fabio Capello about Rooney's fitness and leave it up to him. "I have not spoken to Fabio but I hope to do so in order to explain the situation," Ferguson told Press Association. "He can then decide after dialogue with the physios whether it is worth taking Wayne to Seville. "I have no strong issue with that. It is a question of whether he would play or be a substitute, which is the same position as I am in. "It is up to Fabio," he added. United have still prospered in the absence of Rooney, moving two points clear in their defense of the English title, but his return will give them a further boost with vital league and Champions League fixtures in the offing. 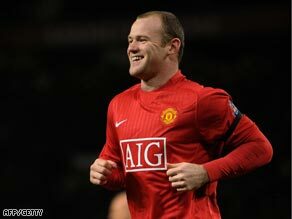 A fully-fit Rooney would certainly be part of Capello's plans as they take on the European champions in their midweek friendly where David Beckham is set to be recalled. Beckham, who said earlier this week he wants a permanent move to AC Milan, will equal Bobby Moore's record of 108 caps for an outfield player if selected. Meanwhile Spain coach Vicente del Bosque called up uncapped Barcelona youngsters Gerard Pique and Sergi Busquets for next week's friendly. Defender Pique, 22, and 20-year-old midfielder Busquets were the newcomers in a 22-man squad which includes 18 of the players that last year helped Spain win the European Championships. Former Manchester United player Pique has the better chance of playing with both regular central defenders Carlos Puyol and Raul Albiol struggling with injuries. Del Bosque believes the two teams are currently the best in Europe and is looking forward to the clash. "It's a very prestigious meeting, as much for England as for us, and it would be good to win. We are possibly the two best teams in Europe at this moment," he said. "It is a friendly against a strong opponent, which we must use to continue growing." Spain beat England 1-0 in their last meeting at Old Trafford in 2007 to spark a 28-match unbeaten run, culminating in their Euro 2008 triumph.